Figure A51. Lougheed anomaly, interpreted as the Lougheed slab, with (horizontal) [vertical] cross sections through (A)[D] the UUP07 p-wave) and (B)[D] the combined SL2013 and S40RTS s-wave models at 1410 km; C) the location of the modern geological record that we interpret to have formed during the subduction of the slab. 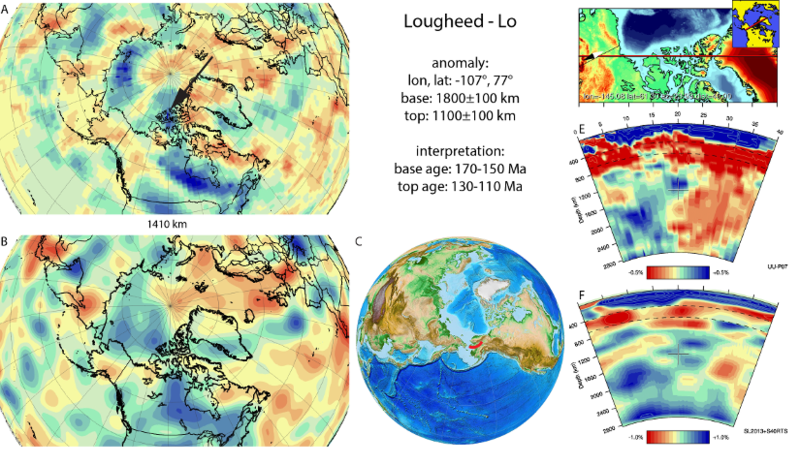 The Lougheed anomaly (Figure A51) is located below northernmost North America within the mid-mantle. It is N-S to NNW-SSE trending and at its southern end lies close to, but is separate from the NW-SE trending Hudson slab that is correlated to the Stikhinia arc in northwest Canada. The Lougheed slab should thus correlate to circum-Arctic subduction to the north of the Stikhinia terrane. Nokleberg et al. (2000) documented the Koyukuk arc in this area and interpreted this as the result of subduction of Angayucham and Goodnews Ocean lithosphere below North American continental lithosphere. The Koyukuk arc is mainly of Late Jurassic to Early Cretaceous age. In the plate motion model of Shephard et al. (2013), these different elements were brought together. They concluded that subduction below the Koyukuk and the adjacent Nutesyn arcs was active between 160-120 Ma, which we adopt for the subduction age range of the anomaly.